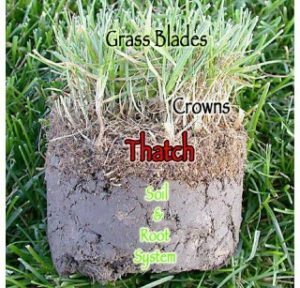 Thatch buildup is rarely due to grass clippings, but to an accumulation of dead fibrous roots and stems that develop between the green turf grass and the soil. A small amount of thatch, about 1/2 inch, is desirable because it insulates the soil against heat and cold. However, an excess accumulation of thatch is detrimental because it causes poor water penetration and localized dry spots. Excessive thatch also provides an ideal environment for insect and disease problems to develop. Removal of excess thatch is imperative. To help reduce thatch, core aeration of the lawn in recommended.